As promised, I am back with a giveaway. I was really not sure what to name this giveaway so since it is the month of love and also Makeup and Beauty Treasure has crossed 3000 Facebook likes I named it Love month giveaway. Thank you much everyone! This blog is growing because of your kind love and support. I would have never reached this milestone without your love and blessings. 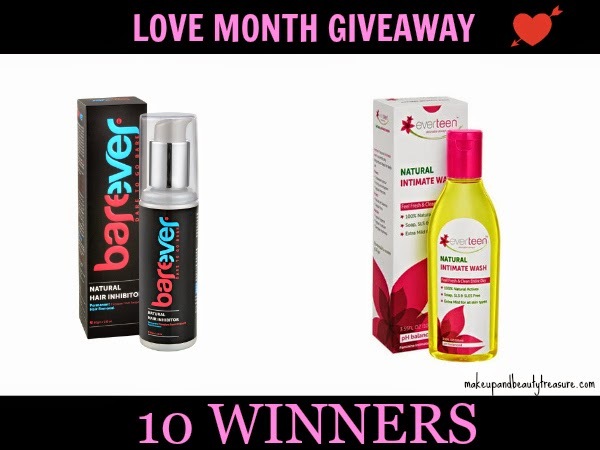 This time the giveaway is sponsored by Pankaj, the owner of the fabulous brands Barever and Everteen. Both the products are amazing and life savers for girls. Read my review on Barever Natural Inhibitor Cream HERE and Everteen Intimate Wash HERE. Thank you so much Pankaj! Your products are AMAZING! This time there will be 10 winners! • There are 6 mandatory entries and you MUST complete them to be considered. Like MBT & Barever on Facebook, follow MBT and Barever on Pinterest, follow MBT on Bloglovin and leave a blog post comment. • There are many other optional entries to increase the chance of your winnings. Enter only if you have done the entries. • Enter the correct details in the rafflecopter form below! • I will not be held accountable if the items get lost or broken in the mail. The prizes would be sent by Barever. • Giveaway ends on 18th February 2015. The winners will be chosen randomly on 20th Febraury and would be notified via email. The winners must reply back within 48 hours of winning or a new winner would be chosen. • Enter only once via Giveaway Tools. No cheating please. I check all entries.